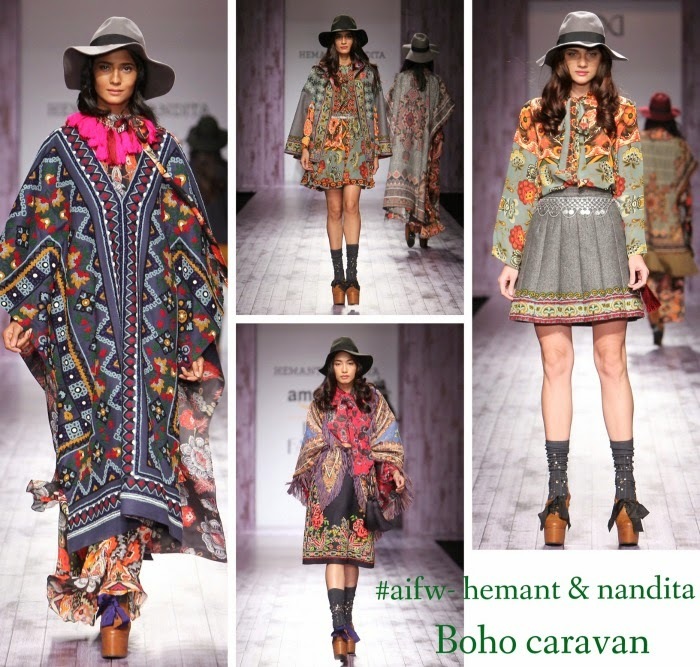 The designer duo Hemant and Nandita collection Boho Caravan made me day dream . Day dream into watching a replay of the movie Bandidas . It was truly an art of story telling. It was a tribal gypsy, with a free flowing mind of its own , and a reflection of the same in those free flowing cover-ups, kaftans, and maxi dresses. The added touch of fringes, silver jewellery took me on a joy ride of watching a nomadic folk with a sophistication that felt as new and in sync with today's times.The rich colour scheme of olives, mustard and dull red had details inspired by pop floral abstract print. Woollen capes, and blankets were delicately attached to the maxi dresses which really filtered the hippie spirit well. Every little detail from printing, the fabric, dyeing had a personal city girl turned turned a country cool touch. The music literally made us all sway , and if you haven't thought of fringes yet, its time you do.